Sánchez-Escribano, R., et al. Kaposi’s sarcoma in a Myasthenia Gravis Anti-Muscle Specific Tyrosine Kynase Antibodies (Musk-Ab) Positive Patient Treated With Rituximab. (2016) Intl J Cancer Oncol 3(3): 1- 3. © 2016 Sánchez-Escribano, R. This is an Open access article distributed under the terms of Creative Commons Attribution 4.0 International License. Myasthenia gravis (MG) can produce severe respiratory impairment with a restrictive pattern, ultimately resulting in dependence on ventilatory support. The anti-muscle specific tyrosine kynase antibodies (MuSK-ab) + variant are often refractory to standard therapy with anticholinesterase drugs and glucocorticoids, responding better to plasma exchange and immunosuppressors. Rituximab, a monoclonal chimeric anti-CD20 antibody, is a valuable therapeutic option in these patients; following rituximab administration, some patients can even revert to a seronegative status. However, the immunological effects of rituximab are also associated with a higher risk of reactivation of chronic or latent infections due to viral agents, such as HBV, JC, or the herpes family, including Human Herpes Virus-8 (HHV-8)[4,5]. The latter virus is responsible for the neoplastic transformation of infected cells that develops in Kaposi’s sarcoma (KS). Here, we report a case of KS in a patient treated with rituximab for anti-MuSK+ MG. The patient was a 76-year-old female diagnosed with MG with seronegative expression of anti-Cholinesterase antibodies and positivity to anti-MuSK antibodies (basal titer of 1.41 nmol/l measured by Radioimmunoanalysis) who presented in June 2014 with bulbar and respiratory manifestations; her disease was identified as stage IVb according to the Myasthenia Gravis Foundation of America (MGFA) staging. Her symptoms did not improve sufficiently with the administration of pyridostigmine and glucocorticoids, and the patient was dependent on noninvasive mechanical ventilation; intravenous immunoglobulin was then initiated without better results. In this situation, with worsening respiratory and swallowing function (with several admissions to hospital, including the intensive care unit [ICU], due to severe hypoxemia), as well as refractoriness to standard therapies, treatment with rituximab was proposed. Previous comprehensive serology testing had discounted the possibility of active or chronic HBV, HCV, or human immunodeficiency virus (HIV) infection. The patient received the first dose of rituximab (375 mg/m2) on 27 July 2014; the infusion needed to be suspended, with 50% of the intended dose administered, due to the worsening of dyspnea related to chills and rigors. At this point, an emergency plasmapheresis was performed, and the patient’s respiratory condition improved dramatically after two plasmapheresis sessions. Rituximab was restarted on 14 August 2014, and the patient received the planned four doses on a weekly schedule without major complications (last dose on 30 October 2014). She remained stable and ambulatory, requiring ventilatory support (BIPAP) only at night, and her swallowing function was good. In December, several bluish skin nodules appeared over the trunk, arms, and legs (Figure. 1), and a biopsy was taken of an upper arm lesion. The pathological report revealed KS showing immunohistochemical positivity for HHV-8 (Figure. 2). In the following days, the patient experienced new worsening of dyspnea necessitating hospital care. Another plasmapheresis treatment was performed, resulting in slight improvement, and then a monthly scheduled chronic plasmapheresis plan was initiated. The patient was sent to the medical oncology department for treatment evaluation of her KS. As part of the staging workup a thoraco-abdomino-pelvic Computed Tomography (CT) scan was done; this revealed extensive metastatic disease affecting both lungs. The patient was diagnosed with stage IV KS, and in February 2015, chemotherapy treatment was initiated with PEGylated liposomal doxorubicin (PLD, 20 mg/m2) on a 21-day cycle; this was carried out concurrently with the monthly plasmapheresis (performed almost one week apart from chemotherapy infusions). The treatment was tolerated well, with subjective improvement in basal dyspnea and no new admissions due to respiratory crisis; moreover, almost complete elimination of the nodular skin lesions was observed after the first two PLD infusions. 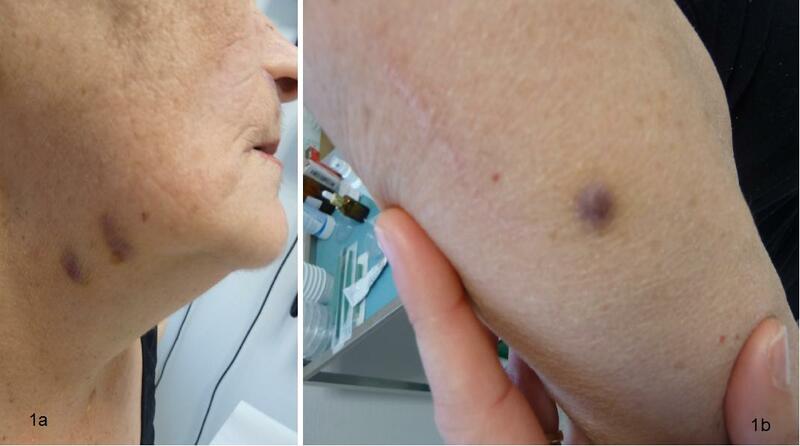 Figure 1: Typical Bluish, slightly sobreelevated, nodular lessions of Kapossi´s Sarcoma in upper neck (a) and forearm (b) of the patient. Figure 2: Pathological slides excisional biopsy of the forearm lession. (a) Higher power 400x magnification, Hematoxylin-eosin stain showing spindled sarcoma cells mixed with blood vessels and inflamatory infiltrate (b) Inmunohistochemical stain for HHV-8 showing intense positivity. In May 2015, the patient was admitted to the pneumology ward with acute dyspnea. After performing an angio-CT scan, a subsegmental embolic thromboembolism was detected with its origin in a deep venous thrombosis in the left iliac vein. The patient rapidly improved with supportive measures, allowing hospital discharge, and she was started on therapeutic anticoagulation with low-molecular-weight heparin. Simultaneously, a new CT scan was performed that showed a significant reduction in lung metastatic disease (Figure. 3). The patient continued on chemotherapy with excellent tolerability and good symptom control until 11 June 2015 (cycle #6). On 17 June 2014, the patient was once again admitted to the ICU due to severe acute pain in the lumbar spine, and a planar X-ray revealed porotic collapse of the T9, T11, and L1 vertebral bodies. The patient was treated with analgesics and bisphosphonates. Reevaluation CT after six cycles showed disease progression (new lung nodules and growth of preexisting ones, as well as retroperitoneal adenopathies). The clinical condition worsened, evolving to a performance status score of 3, mainly due to minimum-effort dyspnea, and new skin lesions involving the trunk and extremities appeared. Chemotherapy was stopped, and further lines of treatment were abandoned because of the patient’s poor general condition; additional plasmapheresis was suspended, and she was admitted to the palliative care program. Finally, the patient died in January 2016. Figure 3: Images of contrast-enhanced torax CT, showing multiple bilateral metastatic lung nodules (a) Initial situation before treatment with PLD (b) After 3 cycles of treatment with PLD. Rituximab is an effective maintenance therapy in refractory MG, especially for the anti-MuSK+ subtype; it eliminates B/plasmablast cells, which are IgG4 antibody producers, but not mature CD20- plasma cells. Acute crisis can also respond to plasma exchange. These two approaches could be used in a complementary fashion in the management of these patients. However, the reduction of B cell populations and other immunological effects of rituximab, such as increasing Treg activity, hypogammaglobinemia, and late-onset neutropenia, could become a trigger for latent HHV-8 reactivation, causing the patient to enter a permanent lytic phase and develop de novo or worsening KS. Such a situation, which also occurred in our patient, was described previously with the use of rituximab in the setting of HIV+, multicenter Castleman disease and autoimmune diseases (off-label use) like refractory autoimmune hemolytic anemia. Simultaneous use of other immunosuppressors, such as long-lasting glucocorticoids, as reported in our patient, could increase the risk of the onset of KS. In accordance with previous reports, the presentation of rituximab-induced KS in our patient was aggressive and clinically fast-developing. Treatment with PLD was well tolerated and effective even in a fragile patient like ours, so we recommend this option in symptomatic patients when local therapies are not suitable. The concurrent use of plasma exchange did not compromise PLD activity in our patient. To our knowledge, this is the first case reported of KS in a patient with MG treated with rituximab. Surveillance for the appearance of KS should be considered in patients receiving rituximab for autoimmune diseases. 1. Guptill, J.T., Sanders, D.B., Evoli, A. Anti-MuSK antibody myasthenia gravis: clinical findings and response to treatment in two large cohorts. (2011) Muscle Nerve 44(1): 36–40. 2. Keung, B., Robeson, K.R., DiCapua, D.B., et al. Long-term benefit of rituximab in MuSK autoantibody myasthenia gravis patients. (2013) J Neurol Neurosurg Psychiatry 84(12): 1407–1409. 3. Iorio, R., Damato, V., Aboini, P.E., et al. Efficacy and safety of rituximab for myasthenia gravis: a systematic review and metaanalysis. (2015) J Neurol 262(5):1115–1119. 4. Diaz-Lagares, C., Perez-Alvarez, R., Garcia-Hernandez, F.J., et al. Rates of, andrisk factors for, severe infections in patients with systemic autoimmune diseases receiving biological agents off-label. (2011) Arthritis Res Ther 13(4): R112. 5. Aksoy, S., Harputluoglu, H., Kilickap, S., et al. Rituximab-related viral infections in lymphoma patients. (2007) Leuk Lymphoma 48(7):1307–1312. 6. Jaretzki, A., Barohn, R.J., Ernstoff, R.M., et al. Myasthenia Gravis: Recommendations for Clinical Research Standards. (2000) Ann Thorac Surg 70(1): 327-334. 7. Law, A.B., Ryan, G., Lade, S., et al. Development of Kaposi´s sarcoma after complete remission of multicentric Castlemans disease with rituximab therapy in a HHV8-positive, HIV-negativepatient. (2010) Int J Hematol 91: 347-348. 8. Clifford, K.S., Demierre, M.F. Progression of classic Kaposi´s sarcoma with rituximab. (2005) J Am Acad Dermatol 53(1): 155-157. 9. Bollen, J., Polstra, A., Van Der Kuyl, A., et al. Multicentric Castleman’s disease and Kaposi’s sarcoma in a cyclosporin treated, HIV-1 negative patient: case report. (2003) BMC Blood Disord 3(1): 3.